We sent Entertainment Editor Adam Reilly to Litchfield Penitentiary to catch up with everybody’s favorite inmate, Julie Lake, who plays lovable ‘meth-head’ Angie Rice. The show on the tip of everyone’s tongues right now is undoubtedly the Netflix original series Orange is the New Black, which this year released a third season. 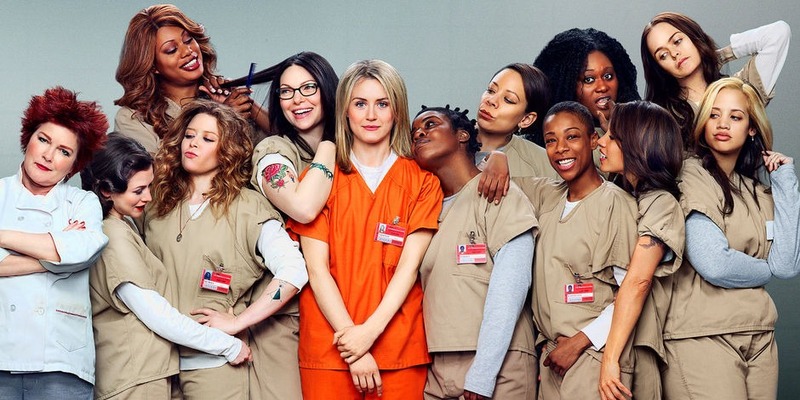 OITNB has taken the world by storm; proving that online series are certainly on the rise and a substantial threat for their television counterparts. Since the show was first released on Netflix in July 2013, it has accumulated an extensive fan-base; one which only continues to increase. The series has racked up dozens of awards and stands alone as the most anticipated and celebrated online show. It’s a very exciting time in Julie Lake’s young career, being part of the hype surrounding one of the biggest shows in the world, so we simply had to find out how it all began for her. Lake quit her day job as a secretary to pursue a full time career in acting and, following meeting her fiance after the second season, her life has significantly changed in a short space of time. Without the show, Lake believes that she wouldn’t have had the confidence to be in the right place to meet the love of her life, so in a way prison has liberated her, well, metaphorically at least. One of the most amazing attributes of the show is surely its huge diversity in the cast that she works with; ranging greatly (and proudly) in all respects from race, religion and sexuality. The show is a kaleidoscope of people from all walks of life and offers an accurate and unbiased view of society, oftentimes not found in many other shows. While all characters in the show represent a different aspect of society and the discrimination that oftentimes comes hand-in-hand, none speak out for a more accepting future than does transgender leading-lady Laverne Cox, whose voice has resonated with audiences worldwide. According to Lake, Cox’s character is “super important” in fighting for equality. As for Lake’s own character, Angie Rice is an impressionable former “meth head” who spends most of her time in the laundry room. There’s a lot of backstory we have yet to discover about Rice; slowly uncovering the stories of inmates before their sentencing is one of the cleverest aspects of OITNB. Lake admits to creating her own history for Angie Rice, while she waits for the writers to develop her character, but she wouldn’t tell us too much, claiming that it was her little secret. She does, however, think her back story is extremely dark and the goofiness of the character lends to her dealing with a past trauma. If, while watching the show, you are alone at home alone, watching Netflix with your cat, you may notice that Litchfield prison is a place of love and romance – well, romance may be pushing the envelope a bit but the love is still there. And with Angie Rice lacking a special someone in her life, we quizzed Lake about if she thinks her character would be compatible with any of the others. Like every show we feel ourselves growing addicted to, we bond with the characters on an emotional level and more than anything else we want the cast to be just as close to each other off-screen as they are on-screen. Well, rest assured, Motley can put your worries to bed, as Lake admits that she loves the whole cast and that she is close friends with all the girls she shoots with regularly – Emma Myles, Kimiko Glenn, Taryn Manning and Abby Savage. “I am also tight with Eden Malyn who plays Sikowitz – we randomly took acting class together in LA at Lesly Kahn. 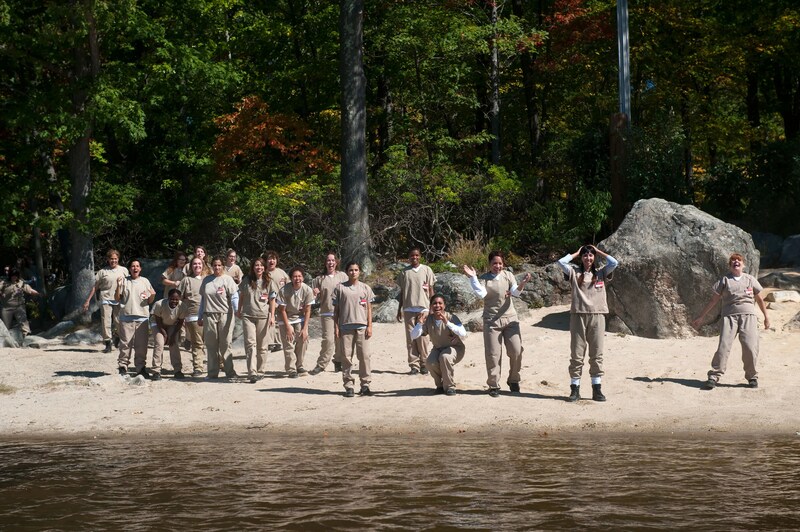 We all might be going hiking together tomorrow.” OITNB fans can now sleep easy. When Lake isn’t spending time with her cast-mates, she’s planning her wedding and her “epic honeymoon in Argentina.” So if you are a fan from Argentina, Lake asks you throw some location tips her way. Wedding planning and filming aside, you could typically see Lake in the Columbia University Library (which she’s always sneaking into) and if you’re looking to run into the star she told Motley that you can find her and the other cast-mates together in restaurants that surround the studio where they shoot in Queens. Before we let the mischievous meth-head go (her character, obviously, in real life she is far too pretty to be a meth-head) we explained to her that the season three finale was met with a certain backlash due to its anticlimactic ending. The season ended on a heart-warming note, seeing the inmates enjoying precious freedom in the neighboring lake, which apparently was great fun to shoot.